On page 147 is a discussion of Nuclear Fission Reactors. 2. Note the vocabulary words from Chapter 5 & 17 used in the film from the list below. Take the online vocabulary quiz. The controller of a nuclear power plant and a news reporter discover a fault in the reactor's system that could lead to disaster. 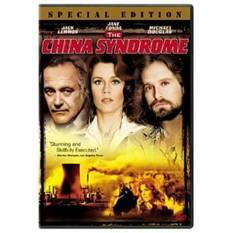 What is the China Syndrome? Research Yankee One and all the other pre-1980 Nuclear Power Plants as to their age and if they are allowed to go above 100% max? What happened at Three Mile Island just after the China syndrome movie was released in 1979! Research what happen in Russia? Research what happen in JAPAN a few YEARs back. How Bad is it now a few years later? Significant release of radioactive material to the environment from explosion of a high activity waste tank. Eleven reactors at four nuclear power plants in the region were operating at the time and all shut down automatically when the quake hit. Subsequent inspection showed no significant damage to any from the earthquake. The operating units which shut down were Tokyo Electric Power Company's (Tepco) Fukushima Daiichi 1, 2, 3, and Fukushima Daini 1, 2, 3, 4, Tohoku's Onagawa 1, 2, 3, and Japco's Tokai, total 9377 MWe net. Fukushima Daiichi units 4, 5 & 6 were not operating at the time, but were affected. The main problem initially centred on Fukushima Daiichi units 1-3. Unit 4 became a problem on day five. 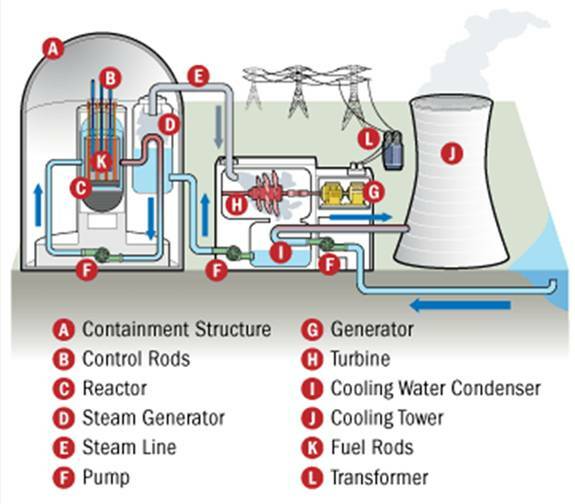 When the power failed at 3.42 pm, about one hour after shutdown of the fission reactions, the reactor cores would still be producing about 1.5% of their nominal thermal power, from fission product decay – about 22 MW in unit 1 and 33 MW in units 2 & 3. Without heat removal by circulation to an outside heat exchanger, this produced a lot of steam in the reactor pressure vessels housing the cores, and this was released into the dry primary containment (PCV) through safety valves. Later this was accompanied by hydrogen, produced by the interaction of the fuel's very hot zirconium cladding with steam after the water level dropped. Much of the fuel in units 2 & 3 also apparently melted to some degree, but to a lesser extent than in unit 1, and a day or two later. In mid-May 2011 the unit 1 core would still be producing 1.8 MW of heat, and units 2 & 3 would be producing about 3.0 MW each. 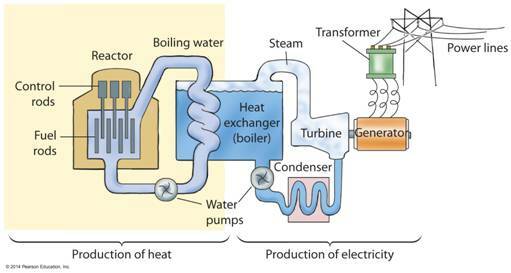 Units 1-3: Water has been injected into each of the three reactor units more or less continuously, and in the absence of normal heat removal via external heat exchanger this water was boiling off for some months. In the government report to IAEA in June it was estimated that to the end of May about 40% of the injected water boiled off, and 60% leaked out the bottom. In June 2011 this was adding to the contaminated water on site by about 500 m 3 per day. In January 2013 4.5 to 5.5 m3/hr was being added to each RPV via core spray and feed water systems, hence 370 m3 per day, and temperatures at the bottom of RPVs were 19°C in unit 1 and 32°C in units 2&3, at little above atmospheric pressure. The next focus of attention was the unit 3 pool. In 2015 the damaged fuel handling equipment and other wreckage was removed from the destroyed upper level of the reactor building. Toshiba has built a 74-tonne fuel handling machine for transferring the 566 fuel assemblies into casks and to remove debris in the pool, and a crane for lifting the fuel transfer casks. The central spent fuel pool on site in 2011 held about 60% of the Daiichi used fuel, and is immediately west (inland) of unit 4. It lost circulation with the power outage, and temperature increased to 73°C by the time mains power and cooling were restored after two weeks. In late 2013 this pond, with capacity for 6840*, held 6375 fuel assemblies, the same as at the time of the accident. The older ones will be transferred to 65 casks in dry storage, with total capacity of at least 2930 assemblies – each dry cask holds 50 fuel assemblies. Eventually these will be shipped to JNFL’s Rokkasho reprocessing plant or to Recyclable Fuel Storage Company’s new Mutsu facility. The dry storage area held 408 fuel assemblies at the time of the accident, and 1004 have been transferred there since (to mid-2014). In mid-May 2011 work started towards constructing a cover over unit 1 to reduce airborne radioactive releases from the site, to keep out the rain, and to enable measurement of radioactive releases within the structure through its ventilation system. 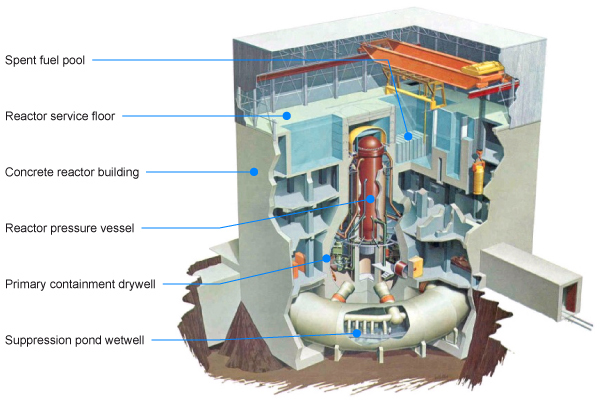 The frame was assembled over the reactor, enclosing an area 42 x 47 m, and 54 m high. The sections of the steel frame fitted together remotely without the use of screws and bolts. All the wall panels have a flameproof coating, and the structure has a filtered ventilation system capable of handling 40,000 cubic metres of air per hour through six lines, including two backup lines. The cover structure is fitted with internal monitoring cameras, radiation and hydrogen detectors, thermometers and a pipe for water injection. The cover was completed with ventilation systems working by the end of October 2011. It was expected to be needed for two years. In May 2013 Tepco announced its more permanent replacement, to be built over four years. It would start demolishing the current cover at the end of 2013 and then remove concrete and other rubble on the top floor of the building. A crane and other equipment for fuel removal would then be installed in a new cover over the building, similar to that over unit 4. Removal of the 2011 cover commenced in 2014. A different design of cover is planned for unit 3, and foundation work had begun in 2012. Large rubble removal took place 2013 to 2015, including the damaged fuel handling machine. An arched cover has been prefabricated and a crane to remove the 566 fuel assemblies from the pool will be fitted fitted in 2016, with its operation removing the used fuel in FY2017. Fuel debris retrieval from within the reactor is scheduled from about 2021, after that from units 1&2 is started. 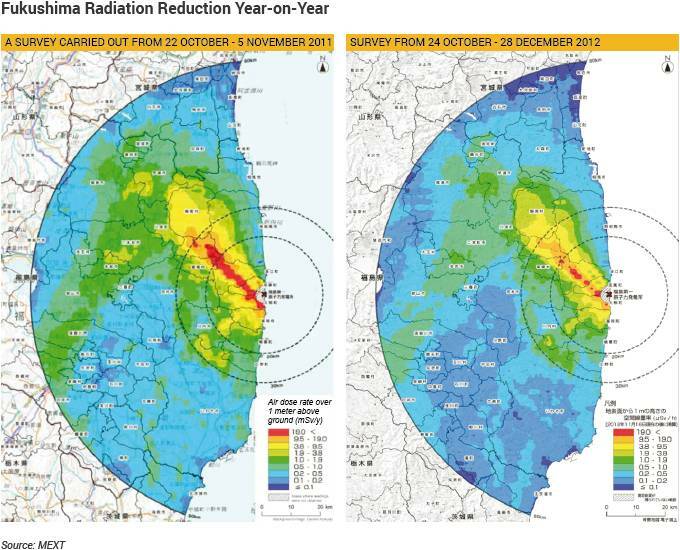 By the end of 2011, Tepco had checked the radiation exposure of 19,594 people who had worked on the site since 11 March. For many of these both external dose and internal doses (measured with whole-body counters) were considered. It reported that 167 workers had received doses over 100 mSv. Of these 135 had received 100 to 150 mSv, 23 150-200 mSv, three more 200-250 mSv, and six had received over 250 mSv (309 to 678 mSv) apparently due to inhaling iodine-131 fume early on. The latter included the two unit 3-4 control room operators in the first two days who had not been wearing breathing apparatus. There were up to 200 workers on site each day. Recovery workers are wearing personal monitors, with breathing apparatus and protective clothing which protect against alpha and beta radiation. So far over 3500 of some 3700 workers at the damaged Daiichi plant have received internal check-ups for radiation exposure, giving whole body count estimates. The level of 250 mSv was the allowable maximum short-term dose for Fukushima accident clean-up workers through to December 2011, 500 mSv is the international allowable short-term dose "for emergency workers taking life-saving actions". Since January 2012 the allowable maximum has reverted to 50 mSv/yr. Summary: There have been no harmful effects from radiation on local people, nor any doses approaching harmful levels. However, some 160,000 people were evacuated from their homes and only in 2012 were allowed limited return. In October 2013, 81,000 evacuees remained displaced due to government concern about radiological effects from the accident. Comments on the radiation situation by international experts are posted on Prime Minister & Cabinet official website. In December 2011 the government said that where annual radiation dose would be below 20 mSv/yr, the government would help residents return home as soon as possible and assist local municipalities with decontamination and repair of infrastructure. In areas where radiation levels are over 20 mSv/yr evacuees will be asked to continue living elsewhere for “a few years” until the government completes decontamination and recovery work. The government will consider purchasing land and houses from residents of these areas if the evacuees wish to sell them. The Fukushima prefecture has 17,000 government-financed temporary housing units for some 29,500 evacuees from the accident. The prefectural government said residents could continue to use these until March 2015. The number compares with very few built in Miyagi, Iwate and Aomori prefectures for the 222,700 tsunami survivor refugees there. (Japan Times 17/11/13) Another reported contrast from the Reconstruction Agency is that some $30 billion has been paid to 84,000 nuclear accident refugees but only some $20 billion to 300,000 tsunami survivors in the Tohoku region. In June 2015, 108 m3/day of clean water was being circulated through each reactor (1-3). Collected water from them, with high radioactivity levels, was being treated for caesium removal and re-used. Apart from this recirculating loop, the cumulative treated volume was then 1.232 million cubic metres. In storage on site was 459,000 m3 of fully treated water (by ALPS), and 190,000 m3 of partially-treated water (strontium removed), which was being added to at 400 m3/day due to groundwater inflow. Almost 600 m3 of sludge from the water treatment was stored in shielded containers. Units 5 & 6, in a separate building, also lost power on 11 March due to the tsunami. They were in 'cold shutdown' at the time, but still requiring pumped cooling. One air-cooled diesel generator at Daiichi 6 was located higher and so survived the tsunami and enabled repairs on Saturday 19th, allowing full restoration of cooling for units 5 and 6. While the power was off their core temperature had risen to over 100°C (128°C in unit 5) under pressure, and they had been cooled with normal water injection. They were restored to cold shutdown by the normal recirculating system on 20th, and mains power was restored on 21-22nd. In June 2015 the government revised the decommissioning plan for the second time, though without major change. It clarifies milestones to accomplish preventive and multilayered measures, involving the three principles of removing the source of the contamination, isolating groundwater from the contamination source, and preventing leakage of the contaminated water. It includes a new goal of cutting the amount of groundwater flowing into the buildings to less than 100 m3 per day by April 2016. The schedule for fuel removal from the pond at unit 1 was postponed from late FY17 to FY20, while that for unit 2 was delayed from early FY20 to later the same fiscal year, and that at unit 3 from early FY15 to FY17. Fuel debris removal is to begin in 2021, as before. Tepco affirmed the revised plan. Storage ponds: First, debris has been removed from the upper parts of the reactor buildings using large cranes and heavy machinery. Covers will be built as required, and overhead cranes and fuel handling machines necessary to remove the spent fuel assemblies will be reinstalled, as already at unit 4. That for unit 3 is likely to be fitted from 2016. Casks to transfer the removed fuel to the central spent fuel facility have been designed and manufactured using existing cask technology. From 2016 Tepco expects to move 514 used fuel assemblies from unit 3 to the central pool, as well as 52 new ones, and then 292 used fuel assemblies and 100 new ones from unit 1. Finally unit 2 will have its 587 used assemblies and 28 fresh ones moved. Units 1-4 were shut down automatically due to the earthquake. The tsunami - here only 9 m high - affected the generators and there was major interruption to cooling due to damaged heat exchangers, so the reactors were almost completely isolated from their ultimate heat sink. Damage to the diesel generators was limited and also the earthquake left one of the external power lines intact, avoiding a station blackout as at Daiichi 1-4. Staff laid and energised 8.8km of heavy-duty electric cables in 30 hours to supplement power. There is no technical reason for the Fukushima Daini plant not to restart. restart. However, Tepco in October 2012 said it planned to transfer the fuel from the four reactors to used fuel ponds by March 2015. In February 2015 the prime minister said that restarting the four units was essentially a matter for Tepco to decide. On 11 May 2011, Tepco accepted terms established by the Japanese government for state support to compensate those affected by the accident at the Fukushima Daiichi plant. The scheme includes a new state-backed institution to expedite payments to those affected by the Fukushima accident. 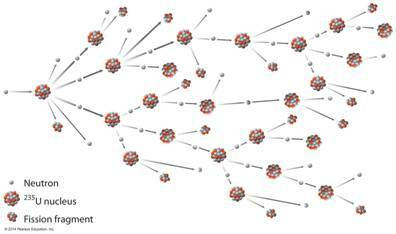 The body receives financial contributions from electric power companies with nuclear power plants in Japan, and from the government through special bonds that can be cashed whenever necessary. The government bonds total JPY 5 trillion ($62 billion). Tepco accepted the conditions imposed on the company as part of the package. That included not setting an upper limit on compensation payments to those affected, making maximum efforts to reduce costs, and an agreement to cooperate with an independent panel set up to investigate its management. The government ordered nuclear risk and safety reassessments – so-called "stress tests" – based on those in the EU for all Japan's nuclear reactors except Fukushima's before they restart following any shutdown, including for routine checks. These were in two stages, and are described in the Japan Nuclear Power paper.